Sawtooth Brewery, the Tap Room and the Public House continue to evolve at is expands, grows and makes its mark on the Wood River Valley. The grand opening of Sawtooth brewery happened 11/11/11 in a small space in the Clarion Hotel in Ketchum, where Kevin Jones and Paul Holle had a vision for a place that people could go for tasty craft beer after a long day of skiing or biking. That vision has come to fruition. They have built on their success to now running two restaurants; the Public House in Ketchum and the Tap Room in Hailey. They also have moved the brewery to their Hailey location where they now produce over 1000 barrels of craft beer per year and sell their beer all over Idaho. 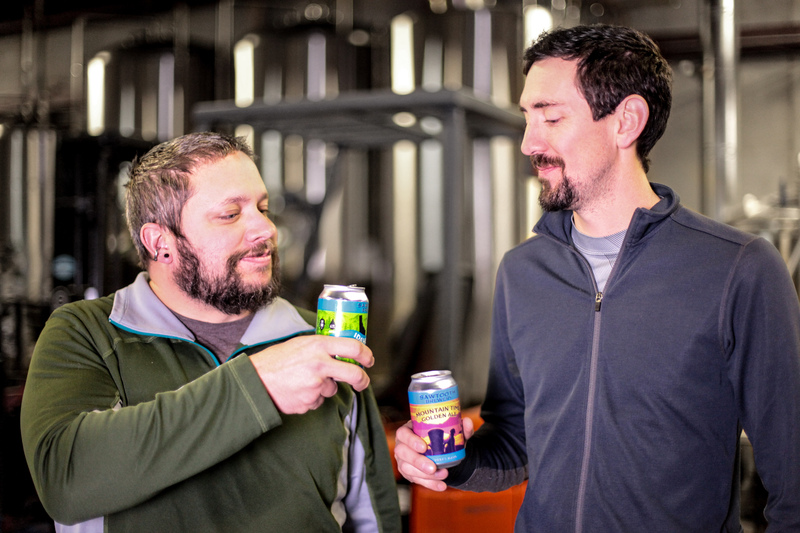 Kevin and Paul originally came to meet through a mutual friend at the re-opening of Whiskey Jack’s and quickly realized that they had a similar vision for starting a brewery in the Sun Valley area. After a few meetings and discussion, they began talks of opening their brewery. They agreed that Sun Valley didn’t have as robust of a craft beer culture and wanted to create one. With Paul’s extensive home brewing experience and Kevin’s knack for business, they began working towards their goal in a barn in Elkhorn. Sawtooth Brewery officially opened on Friday 11/11/11, the original tap room opened in a 1,000 square foot space in what is now Hotel Ketchum. At the opening, they ran out of pint glasses and the taps were connected to the wrong kegs, but nobody noticed at the time. People were excited that there was a new brewery in town that focused on bringing high quality craft beer to them. Since then Sawtooth Brewery has turned in to the valley’s largest brewer and began offering high quality pub food. On their 4th Anniversary, they announce the expansion to open the Hailey tap room and Ketchum restaurant. In February 2016, the Public House in Ketchum opened its doors to the public with the Hailey Tap Room opening in July 2016. After discontinuing contract brewing in September 2016, they began brewing on-site in Hailey with a 15bbl brewhouse in November 2016. In July 2017 the Hailey Tap Room started serving food in addition to their beer selection. In December of 2015, Sawtooth Brewery canned their first beers, becoming the first brewery in the Sun Valley area to do so. Since the initial 2 canned releases, they will grow to 5 flagship beers in cans, a canned Seasonal IPA as well as a few one off cans each year. Dave Custer started working at Sawtooth Brewery in 2013 and eventually was brought onto the team full time to run the Public House and Tap Room in 2015. With his extensive experience in the restaurant industry, he was a perfect match to help create the team and culture at the Sawtooth Brewery Public House. About a year after the Public House’s doors opened, Doug Jensen came onto the Sawtooth Brewery team as the Executive Chef to lead the culinary vision of our cuisine. Doug brings years of experience in the culinary field to building our menu. The culture of Sawtooth Brewery is centered around building a craft beer culture in the mountains of Southern Idaho. The brewery supports the idea that we live and work in one of the most beautiful places in the world and it’s important to keep the forests clean and maintain the wilderness areas while enjoying recreation opportunities. In addition to our land being incredibly important, our employees are a huge part of our community and culture as well. We are a year-round employer in the Sun Valley area and work hard to treat our employees well and contribute to the local economy through our 40+ local employees. We could brew our beer elsewhere closer to a larger population but have decided to make a commitment to keeping our operations local to Sun Valley. In our community, the brewery continues to be a leader in local events that add to the Sun Valley beer culture. The brewery not only supports many other local events but also hosts Oktoberfest in Ketchum each September, which has become a staple fall event. On site, the brewery hosts Science Pubs, live music, weekly trivia, and other shenanigans throughout the year. They are also a major contributor of beer donations to many local non-profit events. Overall Sawtooth Brewery continues to evolve and grow. The brewery hopes to expand their selection of beers, begin barrel aging beer, find more local sources of raw materials, and continue to sustainably grow and expand their food and beer selections. Look for more growth and presence of Sawtooth Brewery locally and statewide this summer! We would love to hear from you! Please fill out this form and we will get back to you. Have a beer and let us know what you think! We are always looking for great staff to join our team! To begin, please complete our employment application. Anyone is welcome to apply, submission instructions are on the application, so fill one out! We are always hiring for Front of House & Back of House for both locations. If you are applying for a full-time position, please include a cover letter and resume with your application.